Hi, I love your stuff, but I live in the U.K and don’t know how much this content applies to me. Do you know of any work similar to yours that covers the laws in the U.K? I don’t know of any, sorry. I’ve actually been asked several times to do a guide for U.K. law, so there’s definitely a demand for someone to do it. But my only exposure to your laws comes from old Rumpole stories and a few antique cases that came up way back in law school, which limits my qualifications somewhat. Rule 1: any evidence presented by a madman in a blue box must be accepted, no matter what the circumstances. Isn’t there a huge problem with the exclusionary rule though? If the police kick in the door to your house, without any warrant, or, indeed, any reason, toss everything you own out onto the lawn in front of your neighbors, and tear up the floorboards looking for evidence, and find no evidence, the exclusionary rule offers you no remedy. It only protects the guilty, or, at least, those against whom evidence exists to be found. And, as you yourself have pointed out, it doesn’t deter the state from violating your rights. You are correct that the exclusionary rule only protects those who had something to hide. That’s sort of the whole point. Remember, criminal law does not provide a remedy to private citizens. It’s only about what the state can do TO you, and for what. If a criminal hurt you, then you can seek compensation in a separate civil lawsuit (a whole nother area of law called Torts). Similarly, if the government has harmed you by violating your rights, then you can seek a remedy in a separate civil lawsuit (a whole nother area of law called Civil Rights). I confess I don’t find your first point at all persuasive. This is a republic. Our laws, criminal and civil, do what our elected representatives say they do. If state legislatures (or Congress, acting at the federal level), were to decide to pass laws providing for alternate remedies to illegal searches, as opposed to the exclusionary rule, that would be well within their prerogatives. As to your second point, although it obviously relates to the first, the exclusionary rule manifestly does not protect against unreasonable searches and seizures: it protects only against the possible consequences of such searches or seizures. And remember, the fourth amendment is supposed to protect everyone, not just the guilty. It sounds like we’re in agreement, actually. You’re absolutely right that state legislatures could enact more remedies for illegal searches. People tend not to realize that the federal Constitution defines only the floor, the bare minimum, of your protections from the government. States cannot go below that, but they are perfectly able to grant greater protections. But that doesn’t change the fact that criminal law does not provide a remedy for private citizens when the police violate their rights. That’s civil rights law, which is a different branch of law. 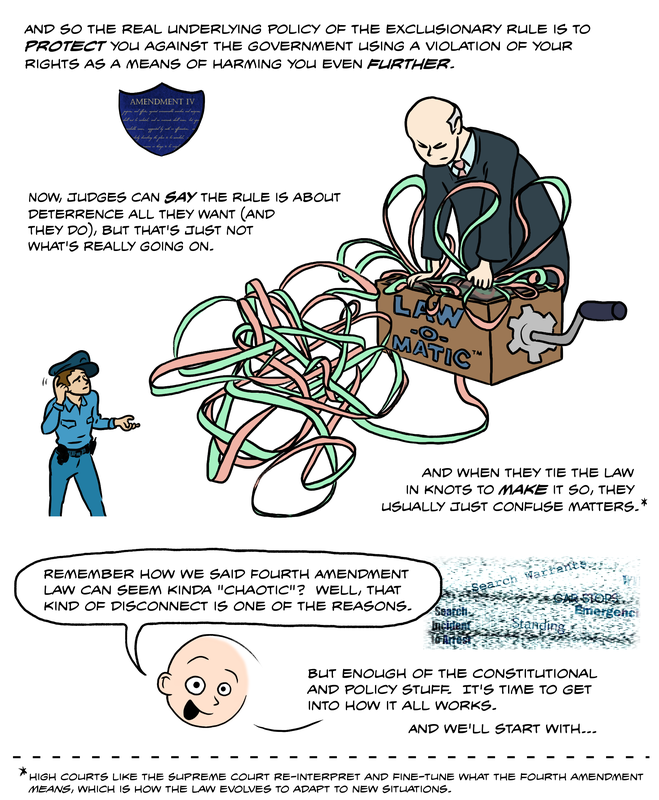 Your second observation is pretty much what I said in the comic: the exclusionary rule isn’t about preventing unlawful searches, but only about limiting their consequences. But lawmakers and policy makers often get this wrong, and thereby cause more than a little confusion. Any power the state gives to an innocent man is power given to a wicked criminal. Conversely, any damage done to a criminal is damage done to law-abiding citizens. The practicality of the exclusionary rule aside, what we’re trying to achieve here is a compromise between 1) protecting our privacy, and 2) catching criminals, both of which are in OUR interests (the state’s notwithstanding). Imagine an open field with shooting targets planted everywhere. You’re told to shoot only the ones painted red, and leave alone every other colors. Blindfolded. Well, you can’t. You have to do *something* to change the situation into one where you can discern between a red target and a blue one. But that *something* that you do has to be done to every one of the targets, since at this point, your power of discernment is non-existent: Every target is the same to you. So it really can’t be helped that privacy *has to be breached* to some level. You just can’t have the best of both worlds. If the 4th amendment promises complete protection from privacy invasion, it’s being naive. All it does is represent your side in the debate on where the compromise should be, whereas no such representatives for our side were around before (or elsewhere in the world).